It’s wild that I’m only now coming to The X-Files in this column. The show is one of my all-time favorites. I was there day one for both movies. I have so many comics. I have all of the books in some format. Then again, it’s not. There have been a mere 6 original prose novels for adults, three prose anthologies, and two YA Origins novels. For a massive pop culture phenomenon, The X-Files left next to no trace in prose. But there are the 8 books and my hope is to cover all 8 in time. Today, we’re going to start as bafflingly as possible with a book almost impossibly far removed from the show. A novel about a teenager investigating a murder in the 1970s is pretty far from the canon we’re used to, even if he’s the central figure of it. 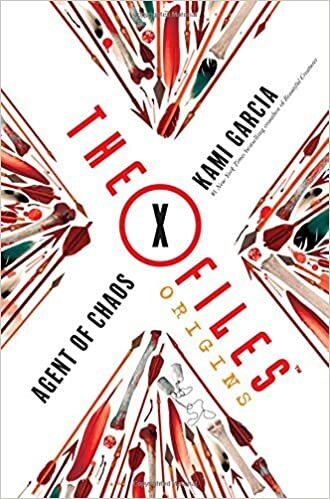 But that’s what we have in The X-Files Origins: Agent of Chaos by Kami Garcia, a novel that depicts Fox Mulder’s first investigation. And really, when you lay out that the book is about that, it’s a perfect prequel. This depicts the moment Mulder realized he belonged in the FBI. Since we can’t get anything paranormal or conspiracy based (ok the book does get into that but not affecting him directly), Garcia focuses on what she can depict which is Mulder’s investigative gift. That’s a great hook and it makes for one hell of a read or listen, as this review is based on the audiobook. The book finds Mulder in his senior year, trying to decide his future. He’s living with his emotionally abusive father. He’s not happy. He’s obsessed with his sister’s kidnapping. When a kidnapping occurs that bears a striking resemblance to hers, he lunges into action, trying to solve it in the hopes he might solve her own. What he stumbles into gets quite weird, though never an X-File. This book easily could’ve been ignored for this column, as I would do with the Scully prequel which is pretty meh, if Garcia didn’t clearly get Mulder. Even though he’s a teen, this is the laconic, witty Mulder we know. Every last detail about him is perfect. As a result, this doesn’t feel like a YA novel with a license slapped on. It feels like the moment Mulder found his calling. And I should stress it could’ve felt like that. The supporting cast in this book is agonizingly generic. There’s a goofy best friend. There’s a proto-Scully whose non-love story is the worst part of the book. (Proof Scully is the core of this world lies in Jonathan Maberry not giving us a proto-Mulder in his book.) There’s a mean dad. Any other writer might’ve stopped at those and not cared to try to sell it harder beyond just putting the main character in there. But Garcia is smart. She gives us a truly great mystery. It doesn’t cheat and make the killer someone familiar either. This is about an investigation, not a twist and it’s a fun one to follow. Details are well laid out and logical without leaps in knowledge. She also goes on ahead and gives us conspiracy stuff anyway. Good old Cigarette Smoking Man is there in a number of scenes stalking Mulder. But he’s not in it as much as his assistant Reggie, who is told at the end of chapter one to forget his identity and go by X from here on out. Yup, this is also an X prequel and that one detail, picking up the backstory of a character we’d never get it on anyway, is a gift. I loved getting to see X slowly harden as he realizes the nightmare he’s in. Then there are the small details embedded in it. The Mulders’ vacuum comes up, which made me grin. Small details about why Mulder is who he is come up. John Douglas and Robert Ressler cameo in the book, names any true crime buff will know. Garcia showed her work hard. I didn’t need a Fox Mulder prequel novel. His backstory is clear from the show. But I’m glad I have this book.